On October 16, 2018, the U.S. Occupational Safety and Health Administration (OSHA) and its State Plan partners began implementing OSHA’s national Site-Specific Targeting Inspection Plan (SST Plan) for general industry (nonconstruction) workplaces that have 20 or more employees. The 1-year SST Plan establishes the procedures and parameters for building a list of workplaces that will be scheduled for SST inspections; how State Plans function within the national SST Plan; how SST Plan inspections interact with other programmed and nonprogram inspections; the relationship of SST Plan inspections to OSHA’s Voluntary Protection Programs (VPPs) and Safety and Health Achievement Recognition Program (SHARP); and the scope of SST Plan inspections. Employers will be subject to SST inspections based on data in the 300A forms they submitted for calendar year 2016. If a 300A form indicates that the establishment is a high-rate establishment—meaning there was a high rate of employee days away from sork, restricted work, or job transfer (DART rate) in the context of a specific industry—the establishment will likely be included on the SST Plan inspection list. OSHA will also create a “random sample” of establishments that failed to provide the required 300A data and include those worksites on the list. All this and more is discussed in OSHA’s SST Plan directive. Employers that meet either of the above two criteria for inclusion on the inspection list should review the directive to understand their rights, as well as what they can expect from OSHA. For example, even if an establishment had a high DART rate for 2016, it may not be included in an SST Plan list if it received a comprehensive safety or health inspection within 36 months of the creation of the current inspection cycle (i.e., October 16, 2018). However, the directive points out that State Plans may either adopt procedures in the directive without change or adopt or maintain different policies and procedures for targeted general industry inspections. These policies and procedures must be at least as effective as those in OSHA’s directive, and they must be approved by OSHA. In other words, a state does not necessarily have to remove a site from an inspection list of workplaces if that site had been comprehensively inspected in the last 36 months. This is the kind of information an employer should have at its fingertips before an OSHA inspector knocks on the door. The rest of this article provides background on OSHA inspections and additional key points selected from the directive. Because its standards directly affect worker safety and health, many stakeholders view OSHA inspections as critical to the Agency’s mission, perhaps more so than with other federal agencies that also conduct inspections—for example, the EPA or the Department of Transportation’s Pipeline and Hazardous Materials Safety Administration. Accordingly, to address different concerns or policy priorities, OSHA has developed different types of inspections. Programmed inspections include SST Plan inspections and national, regional, and local emphasis inspection programs that target high-risk hazards and industries. OSHA currently has nine National Emphasis Programs (NEPs) focusing on lead, shipbreaking, trenching/excavations, process safety management, hazardous machinery, hexavalent chromium, primary metal industries, and combustible dust. Unprogrammed inspections generally follow a complaint, fatality, or referral. Also, OSHA’s VPPs include on-site reviews to determine an establishment’s eligibility for inclusion in a VPP. OSHA has developed this mosaic of inspections and reviews to address an impossible responsibility—using a relatively small contingent of inspectors to ensure worker protections at more than 8 million worksites around the nation. Combined, OSHA and its State Plan partners have about 2,100 inspectors who are responsible for the safety of 130 million workers. That’s about 1 inspector for every 59,000 employees. In 2018, OSHA conducted about 32,000 inspections, while about 44,000 State Plan inspections occurred. Given the immense disparity in worksites and inspections, OSHA appears to be exceptionally careful in how it prioritizes the sites that will be expected, and that’s why policies such as the SST Plan acquire such high importance. Within 60 days following October 16, 2018, State Plans must submit a notice of intent to OSHA indicating if the State Plan will adopt or already has in place targeting policies and procedures that are identical to or different from the federal program. State adoption, either identical or different, should be accomplished within 6 months. If adopting identically, the State Plan must provide the date of adoption to OSHA—due within 60 days of adoption. If the State Plan adopts or maintains enforcement policies that differ from the SST Plan, the State Plan must either post its different policies on its State Plan website and provide a link to OSHA or provide OSHA with an electronic copy and the name and contact information of an official within the State Plan who can assist the public with obtaining a copy. This action must occur within 60 days of the date of adoption. All federal OSHA offices having jurisdiction over sites in State Plan states are expected to inspect all establishments on their inspection lists (i.e., U.S. Post Offices and ship- and boatbuilding and repairing sites) over which federal OSHA has coverage. With regard to establishments in North American Industry Classification System (NAICS) 3366, Ship and Boat Building, federal OSHA and the State Plan must coordinate to determine whether the State Plan, federal OSHA, or both have jurisdiction over the establishment. Because average DART rates vary widely among industries, different DART rates for manufacturing and nonmanufacturing are set as selection criteria to achieve a 50/50 representation on the SST Plan inspection list. To verify the reliability of the Form 300A data reported to OSHA, the Agency will generate a random sample of establishments with low DART rates and include these in the list. Using SST selection software, OSHA area offices determine the size of the SST list to be included in inspection cycles. Size is based on available resources and geographic range of the office. Cycles larger than 50 must be approved by the Regional Office. Once initiated, a cycle must be completed; once the cycle is completed, the area office may generate a new cycle using the SST selection software. The SST is not intended to include establishments that are only office environments. Therefore, if an inspector arrives at an establishment and discovers that there is only an office at the site, the inspector will determine to which site or sites the OSHA Form 300A data apply. For industries that do not have permanent workplaces (e.g., landscaping), the establishment list will normally only identify the employer’s central office. The area office inspectors will, as far as possible (e.g., by visiting the central office), determine active worksites based on the type of work scheduled for each site and the length of time remaining to complete the work at the sites. If an establishment is an approved participant in Pre-SHARP, it may be granted a deferral from OSHA programmed inspections, including an SST Plan inspection. If an on-site consultation visit is in progress at an establishment, it will take priority over any OSHA programmed inspections. If an establishment has requested an initial full-service comprehensive consultation visit for safety and health from an on-site consultation program and that visit has been scheduled by the on-site consultation program, a programmed inspection may be deferred for 90 calendar days from the date of the notification by the on-site consultation program to the Regional Office. No extension of the deferral beyond 90 calendar days is possible unless the consultation visit is in progress. 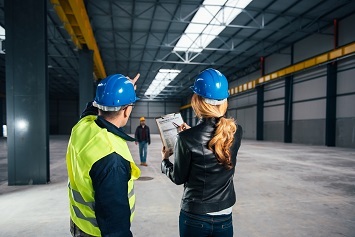 OSHA may, however, in exercising its authority to schedule inspections, assign a lower priority to worksites where consultation visits are scheduled. When the Area Director receives notification from the VPP manager that a VPP on-site review has been scheduled, the Area Director will remove the applicant from any programmed inspection list for a period of up to 75 days before the scheduled on-site review. The Area Director will also remove the applicant workplace from any programmed inspection list for the duration of VPP participation, unless the site chooses otherwise. If an unprogrammed event (e.g., complaint, fatality, or referral) occurs at an establishment that is also slated for inspection under this SST program, the two inspections may be conducted either concurrently or separately. Some establishments may be selected for inspection under the SST program and also under one or more other OSHA emphasis programs (e.g., NEP or Local Emphasis Program (LEP)). Inspection programs based on specific hazards (such as combustible dust or lead) or specific industries (such as logging, scrapyards, shipbreaking, or petroleum refineries) can run concurrently with the SST program. Whenever an establishment is scheduled for an inspection based on the current cycles of both the SST and another emphasis program, both inspections may be scheduled at the same time. If the employer failed to submit but immediately abates during the inspection by providing a paper copy of the records, an Other Than Serious citation will be issued with no penalty. If the employer failed to submit its calendar year 2016 data but shows it has already submitted its calendar year 2017 data, an Other Than Serious citation will be issued with no penalty. Finally, during SST Plan on-site inspections conducted under OSHA’s October 16, 2018, directive, inspectors must review the employer’s OSHA 300 Logs for calendar years 2016, 2017, and 2018 to date. 300 Logs are records employers must keep about every work-related death and work-related injury or illness that involves loss of consciousness, restricted work activity or job transfer, days away from work, or medical treatment beyond first aid. If the inspectors have questions about data in the Logs, they must request that the employer provide more detailed information (e.g., OSHA Form 301).